All newly admitted mature and transfer students are encouraged to take part in the Mature Student First-Year Experience (FYE). The program consists of a free series of stand-alone workshops aimed at supporting mature and transfer students' transition to university. Optionally, students may also participate online via the Moodle platform. Sessions are free, and you are encouraged to attend as many or as few of the sessions as you would like. Please note: some sessions are offered in partnership with other campus resources (e.g., Career Centre and Learning Skills Services) and will take places at their locations. Please make careful note of the date, time and location of the sessions in which you are interested. Our series of in-person sessions will help participants identify their strengths, learn about academic supports on campus, build their academic skills, and make connections to other students. All newly admitted Mature and transfer students are welcome to take part. Below are the current workshops we plan to host over the fall/winter terms. A schedule of sessions and a registration link will be posted on this site by early September, 2018. All sessions are free of charge and students may attend as many or as few as they wish. Registration for the Fall 2018 Face-to-Face Program will be up in August 2018. A mature student’s guide to York’s campus resources York is a big place with lots of supports and resources in place to support mature students on their academic journey. Join us for a quick virtual tour of some of the key resources on campus. Critical Thinking Skills Some times the questions are more important than the answers! This session provides an overview of critical thinking strategies that can be applied in a wide array of classroom settings. Time Management for academic and personal success Juggling a new role as student into an already busy life can challenge even the best time managers. How do you find time to do it all and stay well in the process? Join us for tips on striking the right balance as you strive for academic and personal success. Who am I: Career Explorations This fun and interactive board game will get you started exploring your personality, interests, skills, accomplishments, desires and curiosities. You’ll develop your own personal profile as you gain insights into the most important aspect of career decision making: YOU! What courses do I need? How Academic Advising supports your success With hundreds of courses across so many areas of study available to you, how can you make sure not only that you’re choosing the right courses but that you’re making the most of your educational opportunity? Join us for one of our most popular sessions and learn the ins and outs of academic pathway planning. Getting your needs met: an introduction to self-advocacy Not feeling heard? Too often deferring to what others decide for you? Through self-advocacy you can learn to speak up for yourself and your own needs in ways that respect yourself and others. In this session you’ll identify areas in your own life where self-advocacy is called for and practice strategies for getting your needs met. Becoming a More Effective Communicator Looking to improve your abilities as a communicator? It all starts with being a better listener! This interactive session will explore verbal and non-verbal strategies for better quality communication. Presentation Skills Does the thought of presenting in front of a group give you the jitters? If so, you're not alone. This workshop will provide you with essential tools that will allow you to effectively develop and deliver a presentation. Writing Tips Term paper coming due? Essay to write? Academic writing can be a challenge. This workshop will help you plan, organize and fine-tune your writing, from picking a topic, right through to final proofreading. Managing conflict in personal and professional settings We don’t always see eye to eye. In fact, sometimes we find ourselves in conflict with our classmates, our family members or our co-workers. How we manage disagreements has the potential to build relationships and resolve otherwise intractable differences. Join us to learn some key strategies for conflict management. Information literacy/library skills Looking for some guidance on finding library resources? Don’t get lost wandering rows and rows of books. Join us for an introduction on navigating York’s wealth of physical and electronic library materials. Creating & Maintaining Positive Space Positive Space Training is provided by the Centre for Human Rights at York University. The session aims to create positive safe space on York’s campuses. This workshop will help you lean to respect differences and different aspects of all gender and sexual identities and create a space for you to be included in York’s ongoing conversations and commitment to inclusion (via SexGen York). A mature student’s guide to what’s expected in the classroom So, you made it to University. But how can you make sure you are doing what’s required of you in your courses? Join us for an informative session on university culture, instructors’ expectations, and how to thrive in the classroom. Financial aid planning Paying for school can be a serious business. Recent changes to OSAP mean that you may be eligible for grants and loans from the Ontario government to offset the cost of tuition and books. 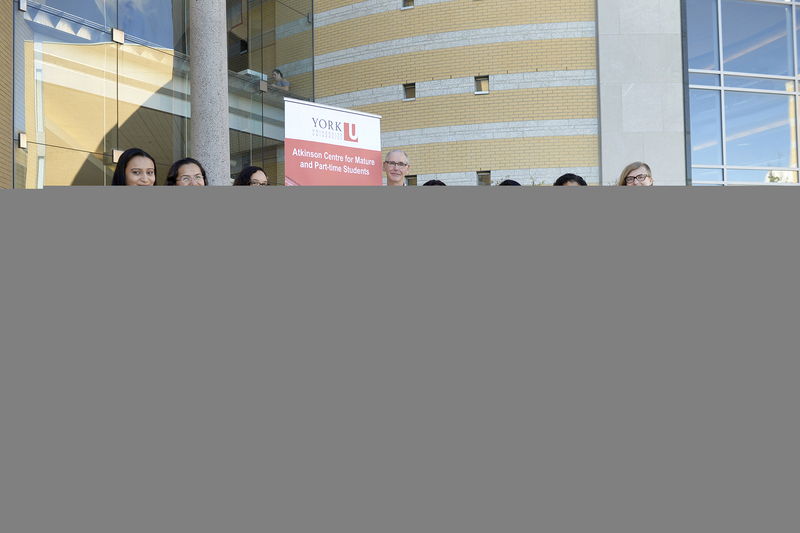 Scholarships and bursaries offered by York can also help make ends meet. Join us for an overview of some key deadlines and the variety of ways you can help fund your education. Giving back – the values and benefits of Volunteering Sharing your time, expertise and energies can be a great way to contribute to the common good. In this session we’ll discuss why volunteering may be right for you and we’ll look at a number of volunteering starting places right here on campus. ACMAPS also provides access to select topics available in our in-person sessions the Mature Student First-Year Experience Program content via a series of online modules. The online modules are available on Moodle, an interactive learning platform used throughout York to deliver course content online. It is available 24-7 and lets you set your own pace for learning. It is a great way to supplement your experience in the in-person workshops or to access a particular topic on a just-in-time basis. Access to these modules is available free to currently enrolled York students. 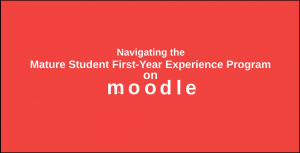 Click on the link above or the image to view the Moodle Mature Student First-Year Experience Program navigation presentation.